The inhabitants of the region of the Yungas mobilized in protest against the death of coca growers in that region in clashes with police while their leader remains in custody. From 2006 to date, there were more than 100 deaths in social conflicts, but so far, no case was clarified despite all the public prosecutor’s investigation announcements. 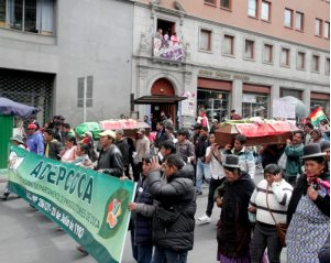 According to data from the Permanent Assembly of Human Rights of Bolivia, in more than 12 years of government under the Movement to Socialism (MAS), more than 100 families mourned their dead and can not find justice. In this regard, the deputy of Democratic Unity (UD), Tomás Monasterios, described the current government “as a repressor, which violates constitutional rights and guarantees, attacks with violence against those who think differently. In the facts is shown that they are capable of doing anything to stay in power,” he said. The former Defender of the People, Rolando Villena, maintained that justice has not assumed responsibility and that due to the abuse of power, human rights were permanently violated and unfortunately in the naturalization of violence. The fallen in these three presidential terms are peasants, indigenous people, university students, miners, police officers, even an ex-vice minister murdered in a confrontation that could have been avoided.